I have enough confidence to put my on money on it. Do you? I then present the evidence. 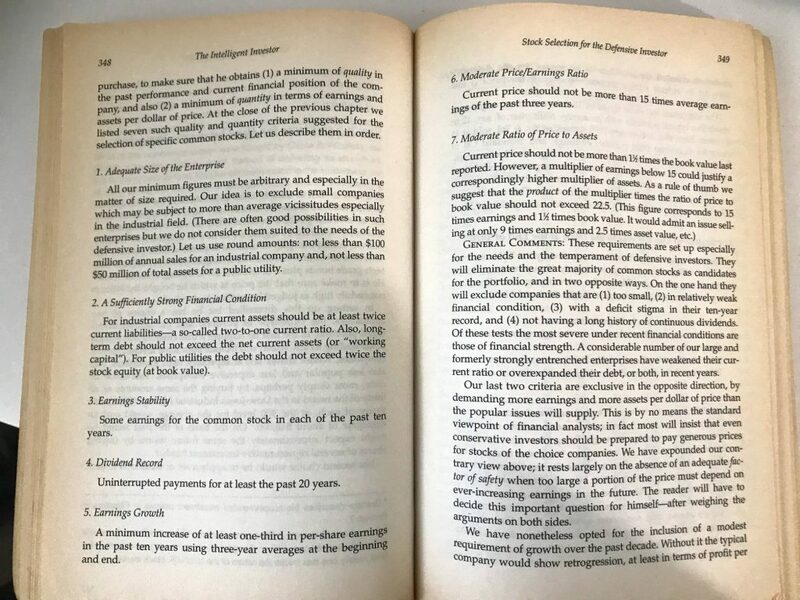 70 years after its publication in “The Intelligent Investor” book, Benjamin Graham’s Stock Selection Criteria for the Defensive Investor still beat the market…and by a wide margin. 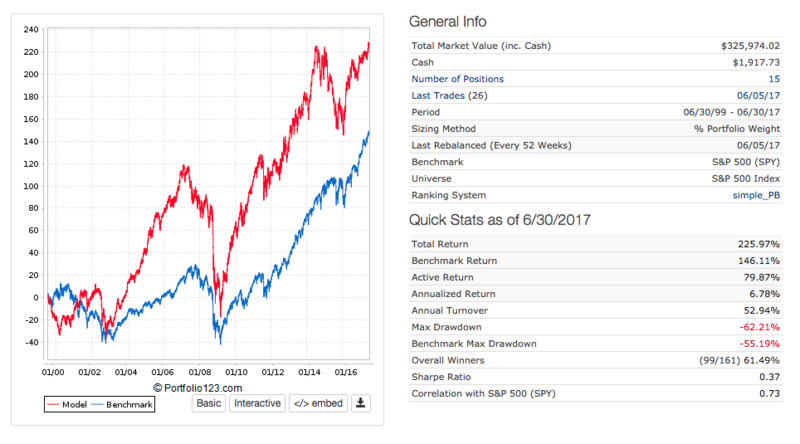 Ben Graham’s well-known system actually have earned twice the market returns (in a simulation) over the last 18 years. And it had done so with lower volatility than the market, which is nothing short of amazing, in my opinion. I describe my implementation of the Graham’s Defensive Investor Strategy and its performance in Part I of this series. In this article, I’ll go deeper into the philosophy behind the strategy and attempt to explain WHY it works so well. Benjamin Graham (1894-1976), known as the father of value investing and as the first quantitative investor in the new era, published his mechanical stock selection criteria in his 1949 seminal book “The Intelligent Investor.” Graham distinguishes between a risk-averse Defensive Investor whose primary goal is the preservation of principal and the Enterprising Investor whose primary purpose is the maximization of investment returns. Not only he pioneered the philosophy of Value Investing, but Benjamin Graham had also created the Analysis profession. Before Graham, there were Statisticians, people who were mostly concerned with the history of dividends that a company distributed or with Dow Theory technical analysis. Graham was the first to bring forth the concept of digging deep into a company’s fundamentals, and intelligently assessing its prospects. It is less known, but Graham was also the first quantitative investor. In his book “The Intelligent Investor” he introduced two mechanical rule-based investment strategies called “Stock selection for the defensive investor” and “Stock selection for the enterprising investor.” Those are essentially algorithms that anyone can apply systematically in his or her investment portfolio. Amazingly, those strategies still beat the market, 70 years after becoming public. 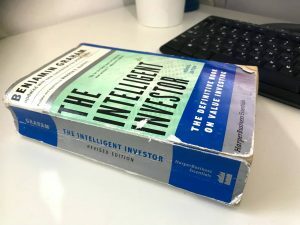 If you haven’t read The Intelligent Investor (at least twice), please stop reading this article now, and buy the book. You’ll thank me later. 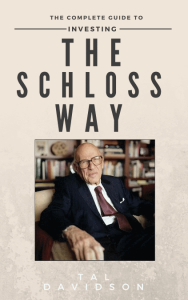 In my website’s FREE RESOURCE library, out of the ten essential books for the serious individual investor, The Intelligent Investor comes first. There should be adequate though not excessive diversification. This might mean a minimum of ten different issues and a maximum of about thirty. Each company selected should be large, prominent, and conservatively financed. Indefinite as these adjectives must be, their general sense is clear. Each company should have a long record of continuous dividend payments. (All the issues in the Dow Jones Industrial Average met this dividend requirement in 1971.) To be specific on this point we would suggest the requirement of continuous dividend payments beginning at least in 1950. The investor should impose some limit on the price he will pay for an issue in relation to its average earnings over, say, the past seven years. We suggest that this limit be set at 25 times such average earnings, and not more than 20 times those of the last twelve-month period. But such a restriction would eliminate nearly all the strongest and most popular companiesfrom the portfolio. In particular, it would ban virtually the entire category of “growth stocks,” which have for some years past been th favorites of both speculators and institutional investors. We must give our reasons for proposing so drastic an exclusion. The idea behind these principles is to ensure the safety of principal and provide an opportunity for out-performance. The safety of principal is achieved through investing in the first three criteria. First, diversification. By spreading our capital across ten to thirty stock holding, we are limiting the idiosyncratic risk of any single stock. 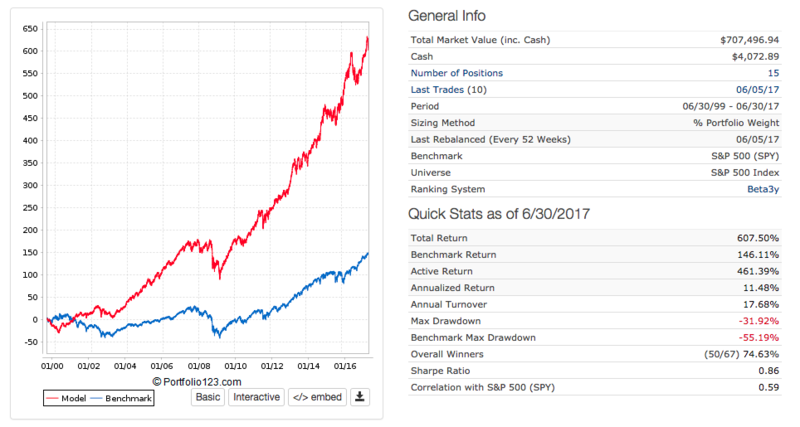 For example, in a portfolio holding 20 stocks, even if one goes to zero, i.e., lose 100% of its value, the overall portfolio loss attributed to this stock is only 4%. In a portfolio holding 30 stocks, the maximum downside due to a single holding would be only 3.33%. More diversification is better, as long as the investor is not compromising on second-grade holdings and not paying excessive fees. The second principle is the selection of large, prominent and conservatively financed companies. Such companies usually possess a prominent positioning in their market, staying power during economic downtrends, and operations in diversified markets. Although exceptions apply, companies that were able to maintain and achieve the status of being large and prominent, are typically less likely to go bust than the typical struggling micro-cap. The third principle is the confinement of dividend-paying companies. While dividend may not be the most efficient way for a company to distribute cash surplus to its shareholders, a long history of dividends serves as some proof that a company has been able to generate surplus cash for distribution over the course of a market cycle, both in up years and down years. Only the last principle contributes directly to the earning potential. This fourth principle can be summarized in three words: “Buy Cheap Stocks.” By buying cheap stocks, you do not overpay for the actual earnings that a company generates. You avoid the “story stocks,” and the “growth plays,” whose price is based on wishful thinking (which sometimes plays out well and sometimes end up badly). By buying cheaply, you pay for real earnings and real assets. 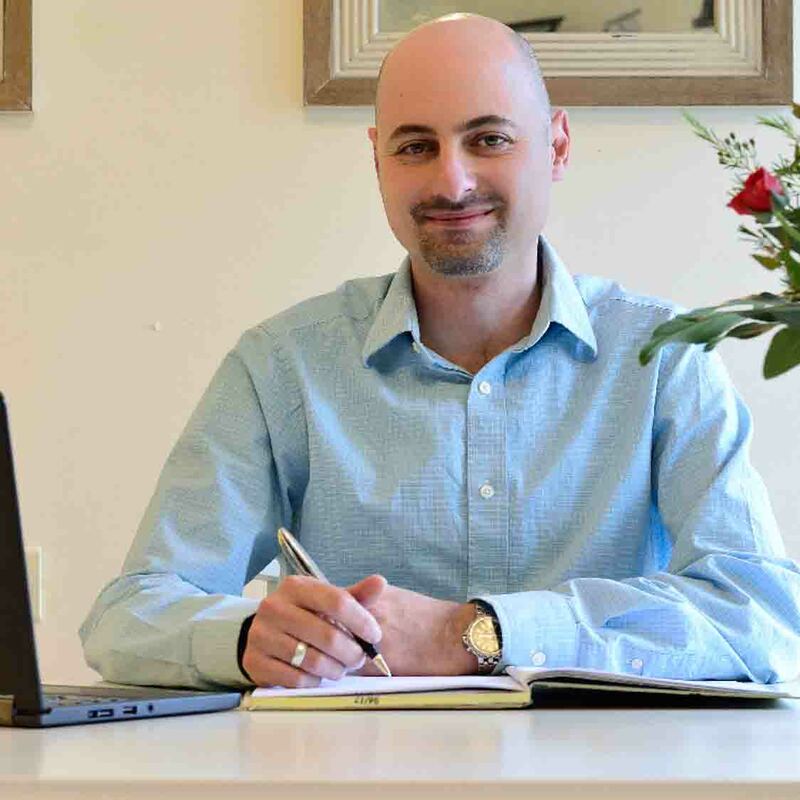 Those are the core principles that Graham proposes to defensive investors, investors that are risk-averse and those who give greater value to the preservation of their invested capital, even on account of missing out the maximum appreciation potential that their money can generate. There are endless ways to devise a trading method which adheres to those core principles. An investor may select defensive stocks by their industry position, rather than their absolute size. An investor can require cash distribution through a history of share repurchases at attractive stock prices rather than be confined to dividend history. An investor can diversify into other strategies, such as momentum (which is what I do in my personal account), rather than diversify strictly within this one strategy. Even concerning valuation, the options facing investors are limitless. Graham suggests selecting cheap stocks based on a measure of cheapness (aka multiple) relative to other stocks. The multiples he uses are Price/Earnings and Price/Book. Many other legitimate multiples can be used, such as Price/Cash-Flows, EV/Sales, EV/EBITDA, EV/EBIT, Price/Tangible-Book-Value, among others. Also, one might choose to use a measure of cheapness relative to a company’s own history or the average industry multiple. We defined our stock universe to be the S&P 500. All constituents are large and prominent companies. Graham suggested to filter out companies whose current ratio (current asset divided by current liabilities) is less than 2, or whose long-term debt exceeds net current assets (current assets – current liabilities). We assume that the constituents of our universe, the S&P 500, possess a sufficiently strong financial position. Applying further rules are not necessary. Such rules would be too restrictive and will result in losing good opportunities rather than avoiding bad companies. Our testing confirms this choice. Graham suggested a positive net earnings figure in any of the last ten years. We are less stringent and require only five years with some net earnings in every year. Graham was suggesting uninterrupted payments for at least 20 years. Over the years, paying a dividend has become less popular and were substituted in part by repurchasing shares or re-investing in the firm. We require uninterrupted payments for only five years. Graham suggested a minimum increase of at least 33% during the last ten years, using three-year averages at the beginning and the end. We adopted the rule as stated. Graham required that the current stock price should not be more than 15 times the average earnings of the past three years. Given the much lower interest rates these days than in Graham’s day, we relaxed the rule to P/E <= 20. Graham required that the multiple of P/E (using average earnings for the past three years) and P/B would be less than 22.5. This rule is interchangeable with the previous rule (OR function between them). We have relaxed it to P/E * P/B<= 30. Applying these rules to the S&P 500 universe results in over 40-150 stocks at any given time. Graham allows the defensive investor to apply his own discretionary judgment as to which stocks to select out of this group. 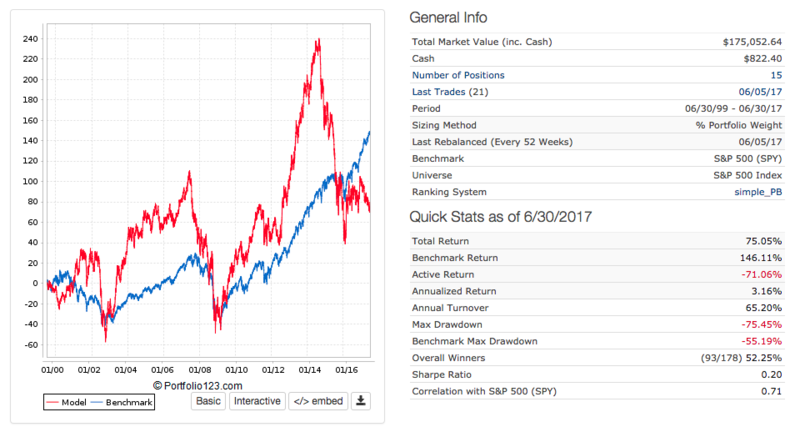 We have performed backtesting with numerous criteria, and we have found that choosing the least volatile stocks (as measured by 3-y Beta) provides the best risk-adjusted returns. Selecting stocks on the merit of either momentum or value results in excellent performance, yet the higher volatility may be uneasy to handle, especially for defensive investors. Let’s how the strategy performs as new rules are added to it. Such a portfolio does not beat the market. It earns only an average annual return of 3.16% vs. the S&P 500 with 5.21%. It has a high asset turnover of 65.20% and a very low Sharpe of 0.2. We now add the conditions requiring stocks to have a 5-year earning history, as well as a 5-year dividend history, as well as growing earnings by at least 33% during the last decade. Better. 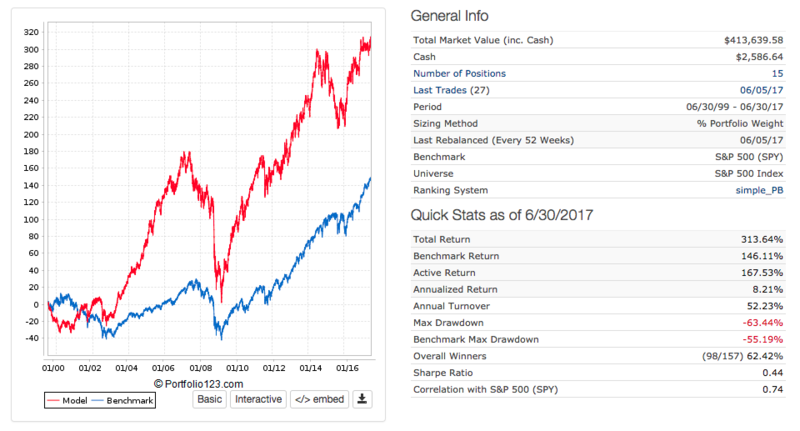 The portfolio does beat the market, with average annual returns of 6.78% vs. the S&P 500’s 5.21% per year. 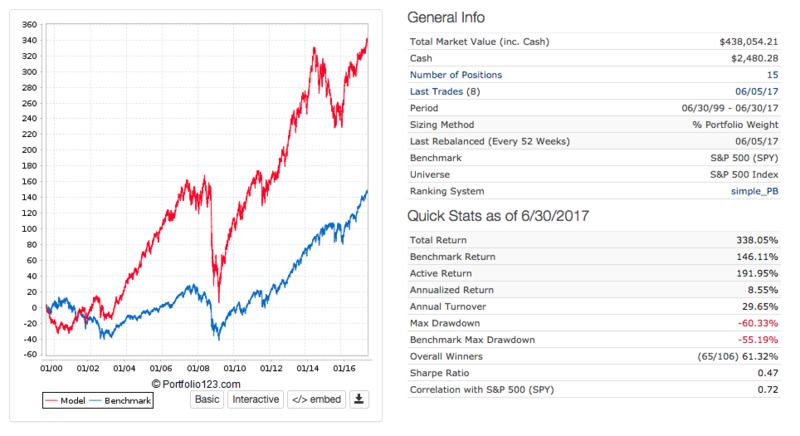 Sharpe is higher, at 0.37, but the portfolio is still very volatile and the asset turnover is excessive, resulting in high transaction costs and a high tax bill. Let’s further improve the portfolio by applying the valuation rules, as described above. Notice that we don’t sell a stock due to its valuation. Even if the multiples have run ahead, we let the stock run. 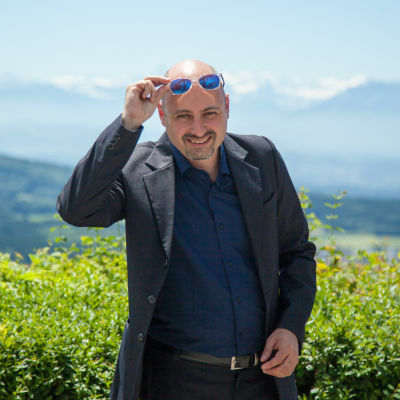 Through trial and errors, I have found this approach to perform better, and reduce the number of transactions. The results have not changed materially, but the annual turnover has decreased, from 52% to just below 30%. Lastly, we change our selection rule. Instead of selecting the 15 stocks with the lowest Price/Book which meet our criteria, we now select the 15 stocks with the lowest 3-year Beta. By doing that, we’re not looking for the cheapest stocks in our universe. Rather, as long as the stocks are cheap enough and meet our valuation criteria, we’re looking for the least volatile stock. Research shows that Beta is a stock factor which correlates to higher performance. The out-performance potential of low beta stocks is described at length in a 2013 academic paper by Frazzini and Pedersen, Betting against Beta. Frazzini, Kabiller, and Pedersen believe that choosing low beta stocks is a key component of Warren Buffett’s approach, as described in their 2012 paper Buffett’s Alpha. These papers are two of the 10 papers and 10 books that every serious individual investor interested in quantitative investing should read. I have links for all of them in my FREE Resource Library on my website. And there we have it. Over a recent period of 18 years, a slightly modified version of Graham’s 70-year-old strategy still beats the market. It does so with double the average annual returns and with lower volatility than the market. There is no magic in the strategy. It is based on conservative selection criteria aimed at preservation of invested capital and on an opportunity created by choosing cheap stocks. Our unique twist is the selection of low-beta stocks and our unique rebalance strategy. I have designed a screener to enable anyone to implement this very strategy quickly. In Part III of this series, will explore how the strategy performed in various market conditions.